It's British crime thriller time, only for a nice change rather than East End accents we get northern ones. 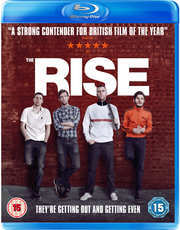 Entertainment One have announced the DVD and Blu-ray release of The Rise for 30th September. The feature debut from director Rowan Athale, this stars Luke Treadaway, Iwan Rheon, Timothy Spall, Matthew Lewis, Neil Maskell, Gerard Kearns and Vanessa Kirby. Alas details beyond this and the content are sketchy, but we do know the runtime will be 1 hour 45 minutes, whilst the rating is a 15 certificate. Expect a recommended retail price of around £12.99 for the DVD and £14.99 for the Blu-ray version. Battered, bruised and under arrest, Harvey Miller sits in a police interview room facing interrogation. Clutching a stack of eyewitness statements, Detective Inspector West has no doubt as to Harvey’s part in a foiled robbery, and the subsequent attempted murder of local businessman Steven Roper. Denying nothing, Harvey agrees to tell his version of events in full. We take in his release from prison a month earlier and the malevolent, unjust act that put him there. We see his emotional reunion with his sibling-like best friends, and the immovable loyalty they have for one another. We see the rekindling of a lost love, a second chance for two people meant for each other. We see the ingenious planning of the ill-fated robbery, the amazing twist, the shocking outcome, and the real driving force behind it, retribution. What unfolds is an exhilarating, moving and often hilarious story of loyalty, jealousy, friendship, revenge and the pursuit of happiness.